Way back in the day, you could customize scrollbars in IE (5.5) with non-standard CSS properties like scrollbar-base-color which you would use on the element that scrolls (like the <body>) and do totally rad things. IE dropped that. These are the pseudo class selectors. They allow for more specific selection of the parts, like when the scrollbar is in different states. On Forrst, they use custom scollbars on code snippets which are also pretty nice. They are less visually intense and so don't fight as much with the code highlighting. Max Voltar websites works in Chrome. That is not the case for your example. Same here with Chrome 10. It works fine for me in Chrome 10. Nice trick, definitely adds a nice touch for websites. Works fine in Chrome mate. What if I wanted to show custom scroll bars on non-webkit browsers? I can’t replicate in Chrome 11 or Safari 5 mac. I have used the plugin at the link below before, it works fairly well. Its not the method Chris uses above, but its a decent JS based plugin. Yet another timely article Chris! The point about this not working in other non-webkit browsers is sadly true – I’ve recently spent quite a while trying to figure out a solution to this specifically for use within text areas. As for text area solutions I’m afraid I didn’t unearth too much but I’m determined to try and figure something out for that too! Great post Chris, thanks a lot! Rumor has it, OS X Lion coming out this year is supposed to get rid of the shiny liquid blue scroll bars in OS X anyway. They’re apparently adopting a flat, gray, iOS feel. Like you said, the blue “thumbs” really shout for attention. That’ll be a welcome improvement. Your demo is broken in both Chrome and Safari OSX. That’s because I’m an idiot. Fixed. Burying. Pity this type of overflow doesn’t work on iOS… any idea on how to enable touch events? I’ve had the same problem, but figured out that @media querys can help. Or Chrome used a cached version. Hi Chris, thanks for this, I really loved it and tried it in my project right away! I hope -moz- comes after this soon, it can make the design more unique, I’d always wanted this and I saw a few flash scrolbars that was awesome in look but creepy in format, ha! but CSS3 is very exciting… and I would love to use it. Is it me or you can’t use the mouse wheel in your example? Mine works to scroll down, but not up. Scratch that! It works Up but not Down. How about fixing broken features in webkit rather than introducing new ones! i.e. the fact that the cursor style on an area tag is never honored in webkit..
Is this broken? I haven’t seen any problems yet. I haven’t tried to do a ton of advanced stuff though. I’d think the most broken part is that isn’t a little unclear and undocumented about what properties the different parts will accept. Regarding the area bug, I hadn’t heard of that, but does sound buggy. Best thing to do of course, is to create a reduced test case and submit as a bug (http://www.webkit.org/quality/reporting.html) If it’s already been reported, submitting your test case will still be helpful in that it’s all the more material to test and registers more interest in the problem. Here’s a good collection of premade scrollbars. One looks like the iTunes scrollbars (marble) and the other is basically just a dark version of that. The download links are broken, but I found the actual downloads. Marble Black. Don’t forget Opera that can do some tweaks to scrollbars since many years as well. I used it on my website, 6 years ago. Not as good as the implementation of Webkit but then, if you want to play with it. Is it possible to place an image on the scroll bar? I’ve used Malihu’s jquery plugin on this website http://bitteart.dk/ to horizontally scroll a client’s gallery. It works pretty well in all modern browsers (I didn’t check in old browsers). Wth is wrong with this website? All text is unreadable in all my browsers. Please use a proper font, or at least fallback to something readable. Webkit scrollers was a part of my personal blog since mid-2010 (I removed it few time back). Nice article Chris. Thanks for the mention, Chris! If only every browser supported this stuff. In time, I suppose. Oh god no. This could be the worst thing in webkit! Scrollbars are the same in every app… if you changed the look of them the average person wouldn’t have a clue what they were. Could be terrible for usability. Do you have any research on that? I know what you mean. Standard looks are familiar to users, they’ve used them before, so they know how to use them again. But these customizations aren’t totally reinventing the concept of a scroll bar. They still basically look like scrollbars if you do it right. I’d wager most users scroll with a mouse motion of some kind, in which case they’d see this custom scrollbar scroll and get it right away. But now that’s just me speculating. Yeah, was speculating too. The only thing I was going on was that changing user expectations has always proved to be a bad thing (only read that from nielsen’s papers). Thing about a scroll wheel is that it scrolls depending on where your cursor is. If you don’t know that something has scrollable content a non-techy user could easily get annoyed at their mouse/trackpad. Also, sorry mate, I didn’t mean to sound rude! It looks like a really cool trick for what it does, thanks for sharing! I love the custom scrollbars but is there a way to resolve how the browser window must be clicked before the keyboard up/down arrays scroll the page? That is kind of a deal breaker. I think these are really cool, especially the usage on Forrst on code examples, which to me look pretty ugly with Apple aqua scrollbars or something like that. I have to agree with most of the commenters over at HN (http://news.ycombinator.com/item?id=2513578) that styling scroll bars is usually a bad idea. Great article, I been into web development with HTML and CSS for a year now, so Im pretty new to all this stuff but it feels nice having access to information like this one so well explained. As many said its a petty that this only works on webkit. Thank you Chris for the awesome stuff here! With this, “background-attachment: scroll” doesn’t work. It is because of “overflow-y: scroll” in the “body”… Any solution? I just noticed that I can only use solid colors for the scrollbars in Chrome 11.0.696.65 on Mac. I had to remove all of the rgba calls for Chrome to function. Otherwise, made a semi-transparent hole in the browser that tried to render my desktop background… kind of strange. 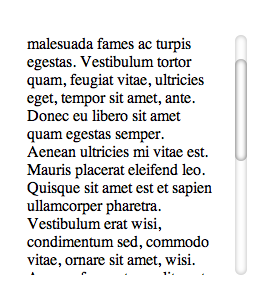 Then un-comment the -webkit-scrollbar styles and you will find that the scroll event listener is no longer triggered. Changing the bind event to “body” will trigger the scroll event listener but scrollTop will be fixed to 0 and height will be fixed to the visible window’s height. I get similar results when I trace $(“html”).scrollTop(); or $(“body”).scrollTop(); from within the event. Even though you can see (in the web inspector) that the scrollbar is attached to the html tag, I have not been able to find a valid selector with which to recapture these values. I even tried selecting the $(“::-webkit-scrollbar-track-piece”) object but alas, no. hi, isn’t this kind of what everyone is looking for and is it workable in all browsers? The website is in french which means i can’t read it but the scroll bar works quite swell for such a small amount of code, and i haven’t used it so i can’t tell what its drawbacks would be . . . Anyone willing to take a look at it? Is it possible to overlay the scrollbar over content? 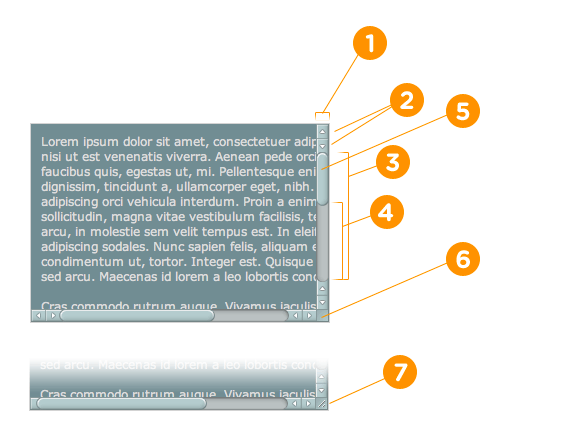 The desired effect would be to fix the “shift” problem where some pages do not require a scrollbar. It would be nice if we could make the scrollbar sit on top of the “content” (actually just a blank gutter in my case) instead of pushing the site to the left. http://aokp.co is a good example of this. it get apply on all the scrollbars, how can i apply it to a particular div ?????? But i’ve got a question: how do you realize this margin from your right border in your example (with the red scroll thumb)? I tried using it at -webkit-scrollbar-thumb (with margin: 30px), also at -webkit-scrollbar and body, but the scrollbar is everytime at right: 0px. buddy, so now how make custom scrollbars in FF and IE ?? How can reduce the thumb height? Burying, because this has already been covered. (See the title of the article).